Whew! Hope everyone enjoyed the short trading month and celebrated the holidays well. We, at RKSV, have been hard at work working on some cool new features that will launch this month. Currency traders rejoice! Now you have another exchange to execute your trades through. All Dream, Pro and Ultimate customers already enabled for NSE CDS can enable BSE Currency Derivatives (BSE CDS) by simply emailing us at support@upstox.com. Volumes on the futures product are comparable to the volumes seen on the NSE. Prices are very competitive and, best of all, transaction charges are low on BSE CDS (use the brokerage calculator). Margin requirements remain the same. Those of you who don't have any currency segments enabled until now can download the segment addition form, sign, and send it across. Until now, cover orders when buying options were only enabled for Pro and Ultimate customers. Starting today, all Dream Plan customers will be able to place cover orders when buying options. This should significantly reduce the amount of margin money required to take a long option position! Read our old post that covers how to place cover orders for options on the NEST. 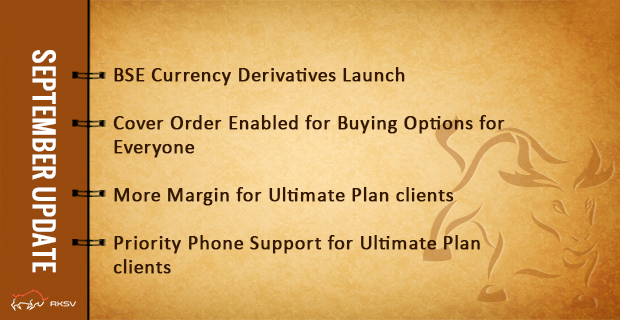 As an Ultimate Plan client, you can now avail more margin when placing Bracket Orders and Cover Orders on F&O. The margin level has been increased from 4X to 5X for all Bracket and Cover orders on Futures for both buy and sell side. For options, the margin level for Sell Side Bracket and Cover Orders has been increased to 5X. Buy Side Option Bracket and Cover Order margins will remain the same. Ultimate Plan clients will get automatic priority phone support. When calling our helpline for any support, your hold times will drop to next to nothing. Not an Ultimate Plan customer? Don't worry, our regular hold times are around 30 seconds anyways and we have reduced it drastically by introducing TPIN verification earlier last month. In cds when trading with one or two lots you charge 0.01%. So the break-even comes bit higher. This hinders small traders like me to check the trading skills. Any alternatives can be done? The charge is 0.01% up to Rs. 20 with first five trades being free. If there are any changes in pricing, we will let you know.